Last year I kept spotting a fieldfare in the orchard and early this year the fieldfare was back and this thime there were two of them. 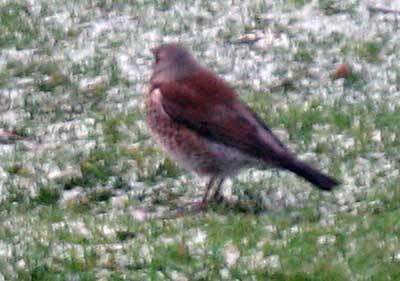 The fieldfare makes a clacking sound and it’s plummage is brown on it’s back and wings with a lighter brown and dappled breast and grey head. I haven’t seen the fieldfare since mid January. 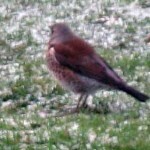 Has anyone else seen the fieldfare lately? 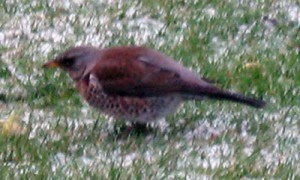 We have regularly sited a fieldfare in the garden this winter. It likes to eat the rotten apples still on the ground from the autumn. Thank you for telling your story. Those pesky fieldfares!!! When we lived in England we had a holly bush ouside the back door. One year it had masses of berries on it and I was looking forward to using them to decorate my house for Christmas. Then a flock of fieldfares arrived and the next day there wasn’t a berry to be seen!